Performers include: Katey Sagal and Roseanne Barr. 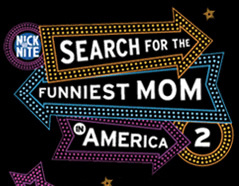 In this six-part reality series, thirteen mothers from across the United States leave their children’s routines, their endless piles of laundry, and their minivans parked in the driveway, for a chance to win $50,000, the opportunity to develop their own show, and to host a special night of shows on Nick at Nite. Contestants are narrowed down to a field of 12 by celebrity judges Kim Coles and Hall Sparks, and the host, of which has included funny moms Sandra Bernhard, Katey Sagal, and Roseanne Barr. Viewers then choose a thirteenth competitor online at the show’s website. After a challenge at the Friars of Beverly Hills, six women are picked to continue on to further challenges that include performing Phyllis Diller’s own act live for the comedienne, and learning improv methods at the Groundlings Theatre. When there are only three contestants remaining, each comedienne is appointed a comedy coach to help them develop a live stand-up routine to be performed at the Alex Theatre in Glendale, California. The mother who trades in tickling toes for funny bones, walks away with the grand prize and title of Funniest Mom. Roseanne: Whatever Happened to Dan, Roseanne, Darlene, and the Rest?